Downward facing dog. Not me. If you think I’m going to put a picture up of my efforts you are much mistook!! Sooooo, since Christmas, in addition to my weekly 90 minute class, I have religiously been doing at least half an hour’s yoga practice every day. My husband leaves home at about 7:20 in the morning and by half past, I’ve started. Usually I use one of the standard classes in the Yoga Studio app on my ipad – either intermediate or if I’m feeling ambitious, advanced level. Its a good, though sometimes challenging, way to start the day. 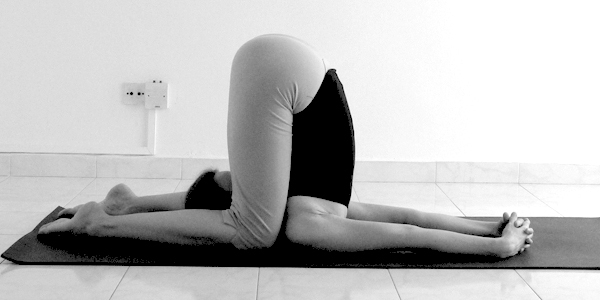 Karnapidasana – Ear Pressure Pose. This is not me, this woman has no tummy…. With all that stretching and bending you would think that by now I would be ready, flexibility wise, to join Cirque Du Soliel, but sadly not. Ok, I’m probably much more bendy than some others of my age, but my left knee still lets me know quite clearly when it’s over flexed in Fire Log or Head of the Cow, my badly feet make Warrior a lot more challenging than it should be (have I mentioned I’ve got Plantar Fasciitis – it’s a right pain! ), and my tummy, though somewhat diminished through over a year’s worth of 5:2 diet, still gets in the way in Ear Pressure Pose (lie down, lift into shoulder stand, drop into plough with your feet behind your head, and then bend your knees and push them against your ears – it’s not pretty, at least not when I do it) and I admit my composure isn’t all it should be when I attempt it – I’m not sure you’re supposed to giggle so much! Bakasana – Crane Pose. Also not me…! I doubt I look this good, just as well I can’t see myself! I guess an hour every day might produce more results, but nonetheless I have felt a massive improvement one way or the other. Yes, I am a lot more flexible, and my balances have improved in leaps and bounds (can one balance in a leap or a bound…no didn’t think so, but you get the gist). The real mega improvement though, has been strength wise. I can hold the plank position for, well, what seems like ages, but is probably no more than a minute or so – much better than the 10 seconds I used to manage though. Even better, I’ve been practicing hard and can now, to my delight, get into Crane and hold it for a bit. Ok, still only seconds rather than minutes, but I’m impressed with myself anyway. Carry on this way, and I may end up like Madonna who’s arms were once described as ‘like dog chews’!! I’ve probably said it before, but yoga is the one exercise regime that feels like its doing me good rather than killing me off. I feel like I can achieve anything, and because it is progressive can find some improvement with practically every session. When I finish I can feel every muscle and sinew, so I know I’ve still got ’em and have not turned to putty just yet. And without wishing to sound all new age, and arty farty, it’s good for the soul too, a bit of inwardlooking meditation or mindfulness really does give your mind a rest from problems and hum-drummery (no, I don’t think that’s a real word either, but hey, I like it). Pigeon with forward fold – nope, still not me. Though I love this pose even though its a bit hurty! Oh, and the other thing, all those Downward Dogs and Pigeons with Forward Folds are really good at stretching me ol’ feet, and the faciitis is slowly getting better. Win win I’d say. Savasana – Corpse Pose. Ok, not me, but I’m really, really, proficient at this one, and a picture of me in this pose would look very similar I promise you! Well I’m off to practice my favourite pose – Savasana (corpse pose) for a bit. After all, it is the bit at the end that we all like best, don’t we? This entry was posted in Ramblings, Uncategorized and tagged 5:2, ageing, exercise, health, life, living, savasana, yoga. Bookmark the permalink. ← Where do flies go in Winter? Good for you! Having a daily yoga practice is invaluable and a great study in self discipline. And “the bit at the end” really is the best. You’ll probably love yoga nidra if you don’t already. Yes, I definitely need a bit of self discipline to get going sometimes, but always glad that I did in the end! Had to look up yoga nidra as I hadn’t come across it before. It sounds lovely. Will have to see if I can achieve! I’m afraid that, through necessity when it comes to my yoga practice (! ),I work on the premise of ‘it’s not the achieving, it’s the striving to achieve’!! Thanks.